Queen frontman Freddie Mercury is one of the most beloved and recognizable figures in rock history, known for his lavish costumes and flamboyant personality - both onstage and off - as well as a four-octave vocal range and an incredibly versatile style that helped lead the band to a string of hits throughout the 70s and 80s. 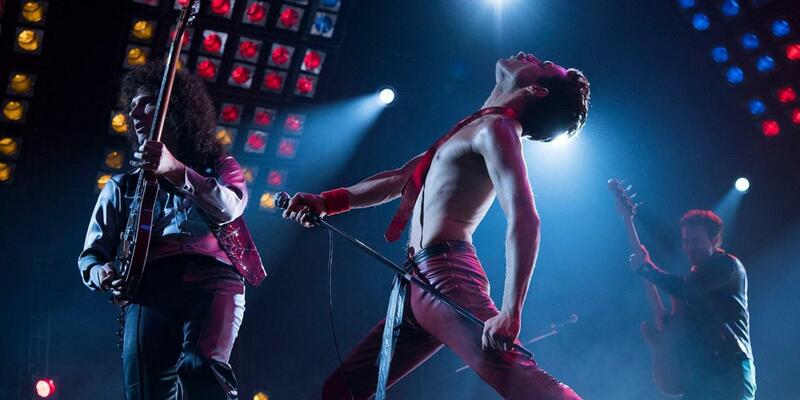 Bohemian Rhapsody, christened after one of the group's most enduring anthems, is mostly a paint-by-numbers biopic, but does offer plenty of material for Queen fans to clap, stomp and sing along with. Played to absolute perfection by Rami Malek, we first meet Freddie in the moments leading up to the group's thunderous performance at 1985's Live Aid benefit concert, giving his iconic mustache a last-minute trimming before making his way toward the stage. 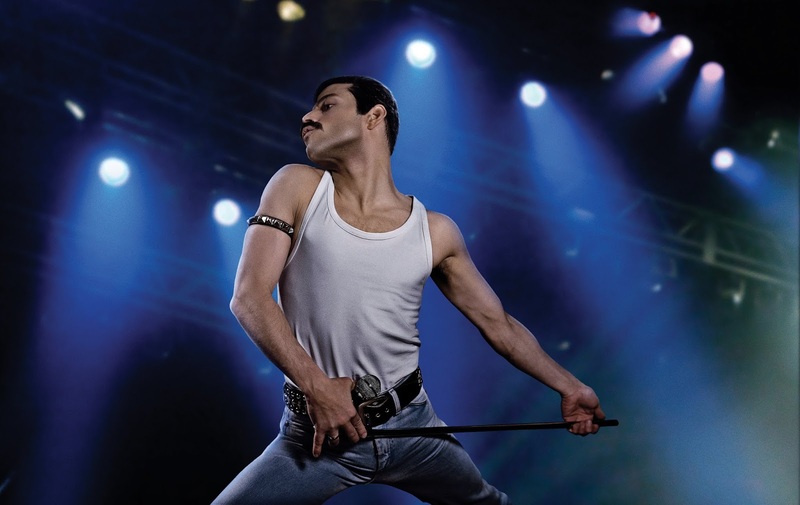 Just as he steps through the curtain, we're transported back to the early 1970s, where Freddie is still Farrokh Bulsara, a Parsi immigrant fascinated with the burgeoning British rock scene. When popular local group Smile loses their lead singer, Farrokh offers his services, but guitarist Brian May (Gwilym Lee) is quick to dismiss him: "not with those teeth, mate." As it turns out, the young man's sizeable overbite - caused by four additional teeth in his upper jaw - have also gifted him with a remarkable amount of vocal flexibility. "More teeth equals more range," he boasts proudly, and within a matter of weeks he's gyrating his way across the stage at local pubs alongside May, drummer Roger Taylor (Ben Hardy) and bassist John Deacon (Joseph Mazzello), and introducing the world to his new persona: Freddie Mercury. Eager to forge a new identity, Freddie also pushes the band to change its name to something more impressive, something more "regal," leading to the birth of Queen. Freddie Mercury may have been a fascinating and enigmatic figure in real life, but Bohemian Rhapsody seems to have little interest in delving much deeper than the surface. It plays like a greatest hits album, delivering numerous montages featuring the band in the recording studio or performing onstage, but lacks true insight into their motivation to constantly experiment with their sound and never get too comfortable. Innovative recording techniques are glimpsed in brief montages, but never explained or explored, and a heated argument between the band and a record executive (Mike Myers, in a cameo that overstays its welcome) over the six-minute operatic song that would become the film's namesake feels more designed to setup a punchline, rather than provide audiences with a glimpse behind the curtain. While not scrubbed from the film completely, Freddie's sexuality is certainly downplayed, and far more screen time is devoted to Freddie's early romance with Mary Austin (Lucy Boynton) - for whom he composed "Love of My Life" and with whom he would remain lifelong friends after breaking off their engagement - than to any other aspect of his private life. Freddie and Mary share numerous intimate scenes with each other, but his other desires are mostly hinted at: a meaningful glance shared with a truck driver as he enters a public restroom, or the aftermath of a drug-fueled party which finds Freddie demanding that his half-clothed guests depart immediately. The only other moments that feel genuinely intimate are his first meeting with a handsome server named Jim Hutton (Aaron McCusker), who tells him "I like you, Freddie. Come find me when you like yourself," and a subsequent reunion that occurs during the third act. Anthony McCarten's formulaic script also seems to play fast and loose with some key aspects of the Queen timeline, positing an acrimonious breakup as taking place in the early 80s, and framing Freddie's HIV positive diagnosis as the driving inspiration to reunite with his bandmates to perform at Live Aid, a notion nearly as offensive as it is erroneous. In reality, the band recorded and released new albums in 1982 (Hot Space) and 1984 (The Works), and toured extensively from late 1984 to early 1985, wrapping up just two months prior to Live Aid - Freddie's diagnosis wouldn't come until two years later, in 1987. The idea of Queen being a last-minute addition to the event also appears to have been fabricated sheerly for the sake of heightening the drama. Factual accuracy regarding the lead-up aside, the Live Aid sequence - which serves as Bohemian Rhapsody's rousing 15-minute finale - is tremendous. Often hailed as one of the greatest rock performances in history, the film recreates the event in painstaking detail, from building a scale model of the original stage right down to ensuring an accurate number of beers and Pepsi cups resting on top of the band's piano. 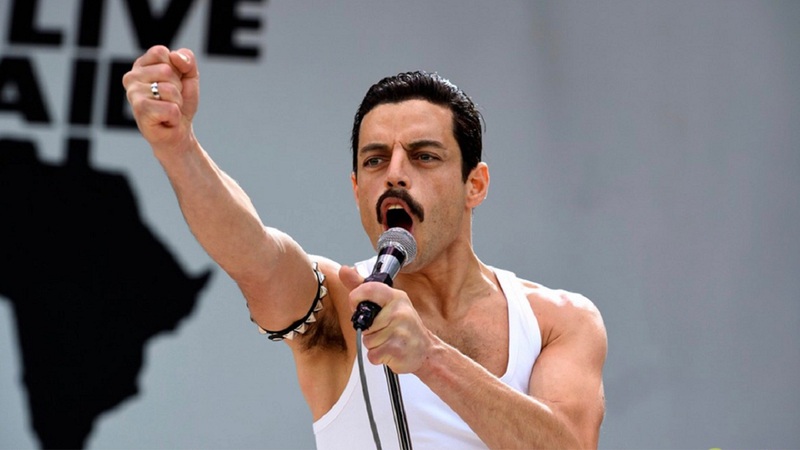 Malek is superb throughout the film, but watching him belt out the lyrics to "Radio Ga Ga" and "We Are the Champions" while pumping a fist in the air feels especially iconic and powerful because so many of us remember these exact moments, and living through them again is undeniably thrilling. Not since Jim Carrey's portrayal of Andy Kaufman in Man on the Moon has an actor so completely and convincingly embodied a real-life figure, and the heart and soul Malek pours into this film will surely make him a tough contender during awards season. It's unfortunate that this overly safe, sanitized film, with its contrivances and clichés (I'd be willing to bet "Another One Bites the Dust" was not conceived in the manner the film wants you to believe) isn't half as daring as Malek himself. Bohemian Rhapsody is an excellent choice for viewers looking to enjoy the band's extensive catalog or to watch a bona fide rock god rise from the ashes, but ultimately feels more like a radio-friendly single than a more personal deeper cut.